Armies have used signaling instruments ever since there have been organized militaries. Trumpets and bugles have always been utilized to relay important information and as a function in everyday military life. The calls, sounded on predominantly brass horns, were crucial as they contained, with their musical notes, important commands to troops preparing for battle and were essential for maneuvering bodies of soldiers on the battlefield. Since bugles and trumpets were an effective way to communicate over long distances, it was natural that they were adopted for military use. 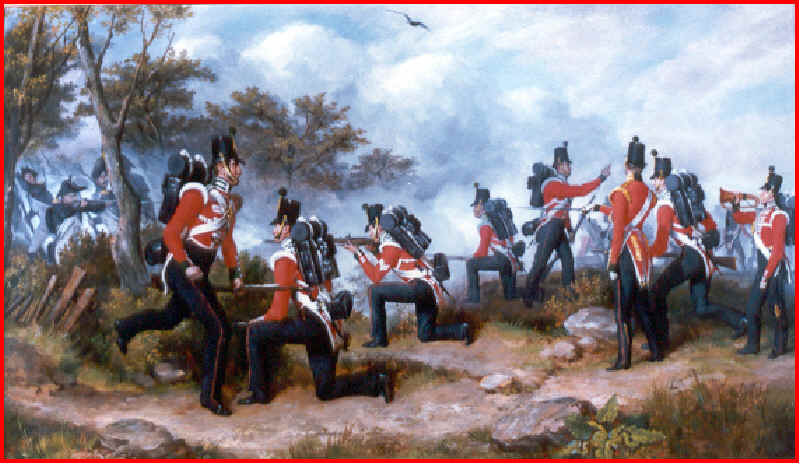 During the time of the Napoleonic Wars, these signals or calls were written down in the infantry manuals of the day. 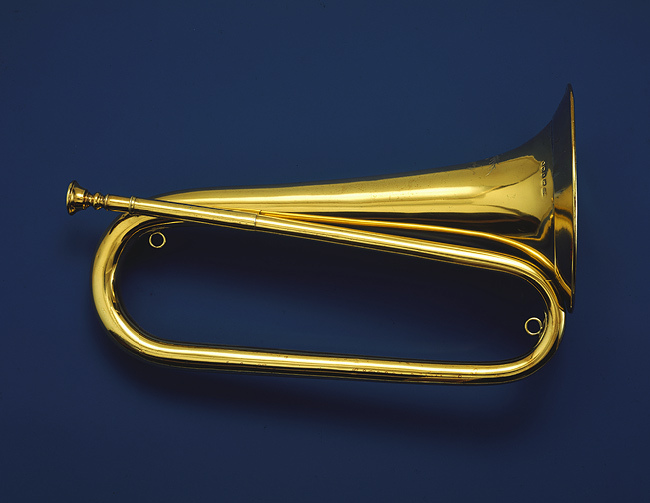 As the American military came into existence, first British, then French bugle/trumpet calls were borrowed for use in the United States infantry and cavalry. The importance of these signal instruments in the U.S. military was evidenced by the adoption of the trumpet as a symbol for mounted rifles in the early 19th century, and of the bugle as a symbol for infantry during the Civil War. 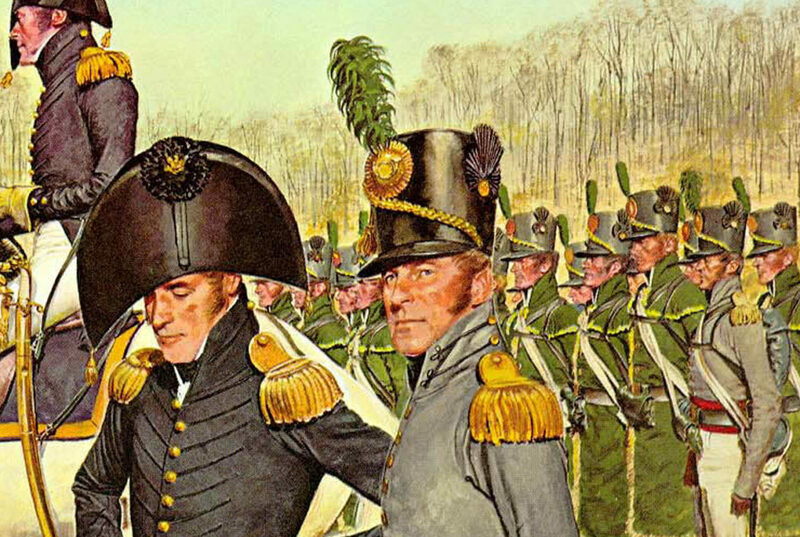 This overview will cover the period of military music in the America armies from the end of the Revolutionary war through the Civil War ending at the consolidation of all service calls into one system and the adoption of new calls that are still used today. There is no doubt that bugles and trumpets were used during the American Revolution. Early in the morning of September 15, 1776 five British warships with 4,000 troops moved into position at Kip’s Bay, NY. Gen. Washington, alarmed by the sounds of the attack, rode south from Harlem and encountered American troops retreating. The British halted at the base of the Harlem Heights plateau and sounded their bugle horn, as if signaling the end of a fox chase. Washington sent out troops for a frontal assault and another to outflank the British. Aware of the flanking movement, the British fell back repeatedly and were forced to retreat. The victory uplifted the Americans, although they had many casualties. So, here is an account of a bugle signal horn used in combat during the Revolutionary War. Reed seems to infer that the horns were not only used to signal troops but also as a means of physiological warfare against the enemy. This is something not new-Gideon, in Judges 7.16, used trumpets as he saved Israel from the Midianites, who, had murdered his brothers. He gathered 300 men and gave each a trumpet. They crept to the Midianite camp in the dark, and on signal blew all the trumpets simultaneously. The terrified Midianites fled with Gideon behind them. He captured their two kings. There is a story that this was repeated centuries later during the American Civil War. 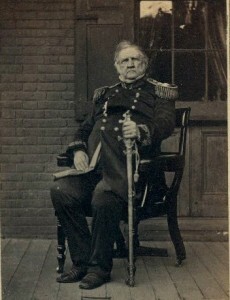 A Union army colonel, James H. Wilson used 250 buglers during the battle of Front Royal, Virginia on September 21,1864. The Union buglers charged the Confederate lines all blowing at the same time. The Confederates broke and ran in full flight. Later in our history, the Chinese Army against American troops used bugles, for the same purpose, during the Korean Conflict and who can forget that during the 1989 siege of the Vatican Embassy in Panama music was used to force Manual Noriega out of the embassy where he had sought refuge. Perhaps not bugle music but achieving the same effects. Psychological warfare…. There are accounts of American buglers and trumpeters sounding calls during the Revolutionary War. 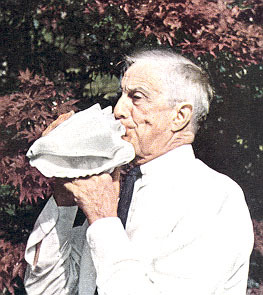 There are also reports of conch shells being used. The distinction of horns, bugles and trumpets plague historians in trying to categorize the signal instruments of the time. This confusion of terms still exists to this day. Trumpets for cavalry did not change their external long appearance. Bugle horns are another matter-one can assume that the instruments were patterned after the English, French or Prussian bugle horns. 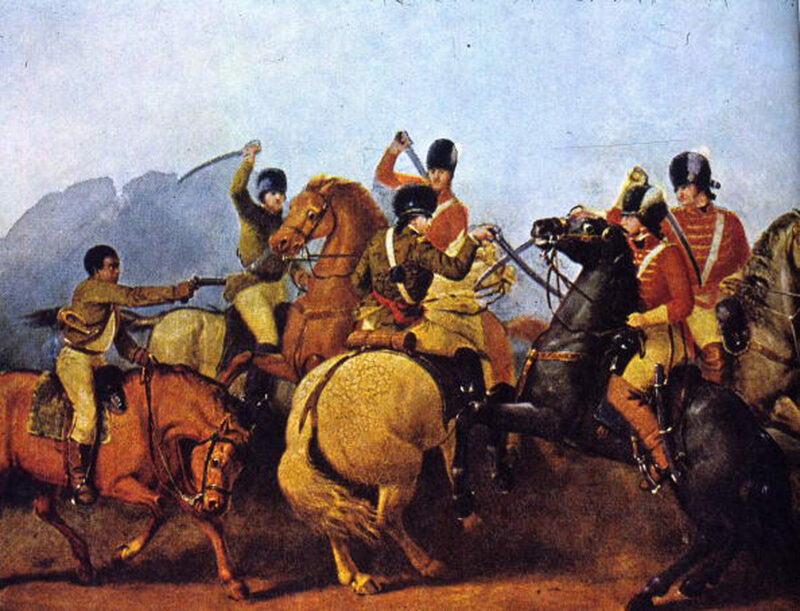 The signal instruments of the Revolution may have been hunting horns or the Halbmond or Hanoverian (or Half-moon) horns for the infantry. These were not the folded over shape of the later British Duty Bugles, rather instruments that looked like French Horns. 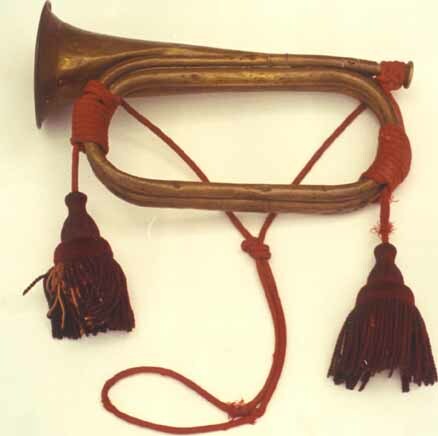 The instrument was made of copper and the straps which formed a “T” shape made it possible to carry the horn. 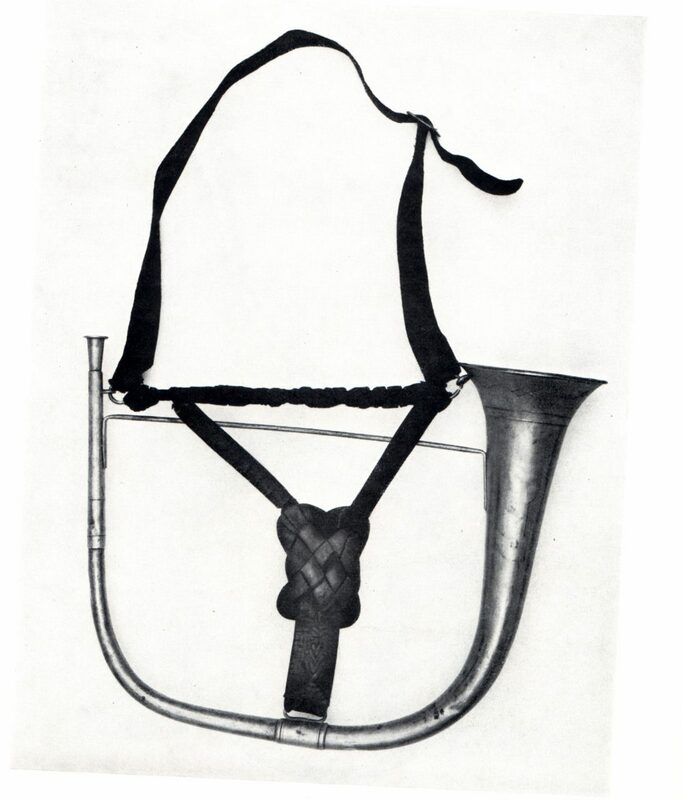 According to Anthony Baines in his “Brass Instruments-Their History and Development”, the Halbmondblaser (Hanoverian Bugle horn) appears in Hanoverian records of 1758 in association with a mixed corps of Light Troops organized by Captain von Scheiter. The horn was pitched in the key of D and had a crook to lower the pitch to C. The instrument was adopted for use by the English Light Dragoons in 1764, by the Grenadier Guards in 1772, and later by artillery and light infantry. 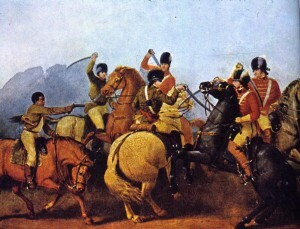 The cavalry used trumpets with crooks which most likely were in the key of E flat. 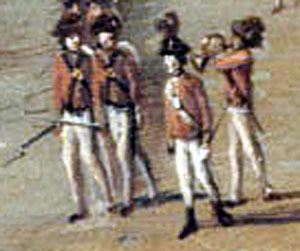 As pointed out by Raoul Camus in his Book, Military Music of The American Revolution, in 1773 and 1774 bugles found favor in the light infantry companies of the British army over the more cumbersome drums. A German post-horn is reported in to have been used. There is little hard proof in pictures or drawings of these signal instruments, though the Hanoverian horn seems to be the instrument of choice for the military. The symbol of the hunting horn is used as the emblem for the US Rifle Regiment. This emblem featured a “Bugle surrounded by stars” when adopted in 1814. The plain hunting horn becomes the insignia for United States infantry by the Civil War and is used though the 1870s until replaced by the crossed rifles. What to do with all the insignia? Why, use them to indicate bugles and field musicians, of course. What horns did they use? 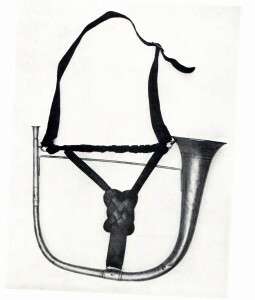 The hunting type horn seems to be the one of choice after the revolution but by 1812 the British had adopted a folded-over pattern bugle horn that had been in use since 1800. According to Baines, The Halbmond was remodeled in bell-front trumpet form, perhaps by William Shaw of London. Pitched in C with a crook to B flat, it also is the model for the Clairons found in Europe. An excellent example is found in the Metropolitan Museum of Art. Engravings on the bell indicate that the bugle was made in the year 1811. Also engraved on the bell is the name Major Drummond of the 104th Regiment, who presumably was the first owner of the instrument. The popularity of this folded over (usually of one twist) bugle horn is evident in the creation of the keyed bugle of 1811 that used the pattern. 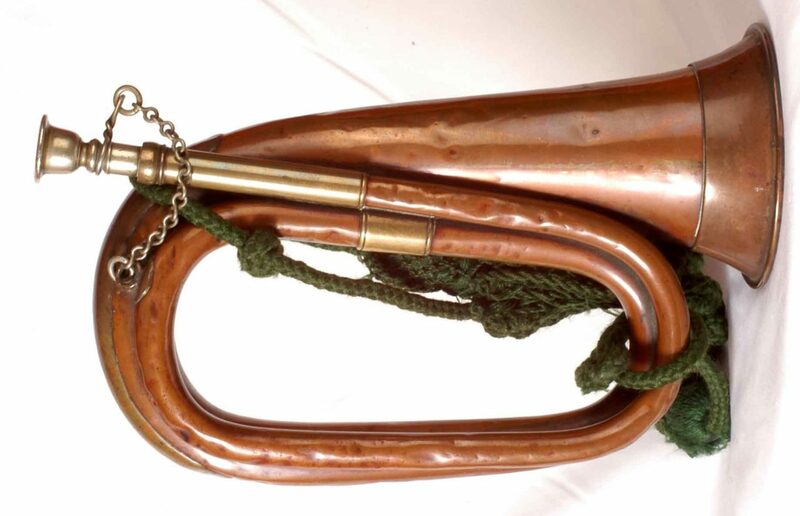 After the Crimean War, a smaller double twist pattern bugle in B flat becomes the British Duty Bugle (known in many circles as the M1855) that is still in use today. 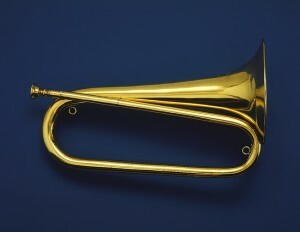 A double twist pattern bugle is found in an exhibit at Fort Benning, GA where a bugle horn that was claimed to be used at the Battle of North Point resides. After the war of 1812 attempts were made to reform the tactics used by the United States Army and divest it from the English practices. In 1814 Congress resolved to form a Board of Officers to modify the French infantry regulations “As to make them correspond with the Organization of the Army of the United States, with such additions and retrenchments as the Board may deem proper.” Winfield Scott was named president the board, a choice made no doubt because of his hero status and the fact that he had used French tactics (the 1791 Manual of the French revolutionary Army) in his camp of instructions that lead to the victories at Chippawa and Lundy’s Lane in July 1814. Scott goes on to visit Europe and study French Tactics close up (as does George McClellan later) and is to influence the use of French Calls in the US military. This entry was posted on Friday, October 1st, 2010 at 10:58 am	and is filed under Bugle Stories, Buglers Through History, General Interest, History of Taps, History of the Bugle. You can follow any responses to this entry through the RSS 2.0 feed. Responses are currently closed, but you can trackback from your own site.